Amy is an independent curator and art advisor based in Hong Kong who has been living in Greater China for over a decade. Foreery an art expert with AXA Insurance in charge of marketing and sponsorships for the company across Asia, she now teaches classes to corporations that acknowledge the equal importance of both the East and the West across millenniums of art history. She is also a museum and corporate collections management consultant, having worked on major cultural infrastructure projects in Mainland China through her company, Ginyu Arts Management. This interview with Mary Rozell, who was recently appointed as Global Head of the UBS Art Collection, took place at the UBS VIP Lounge at Art Basel in Hong Kong. 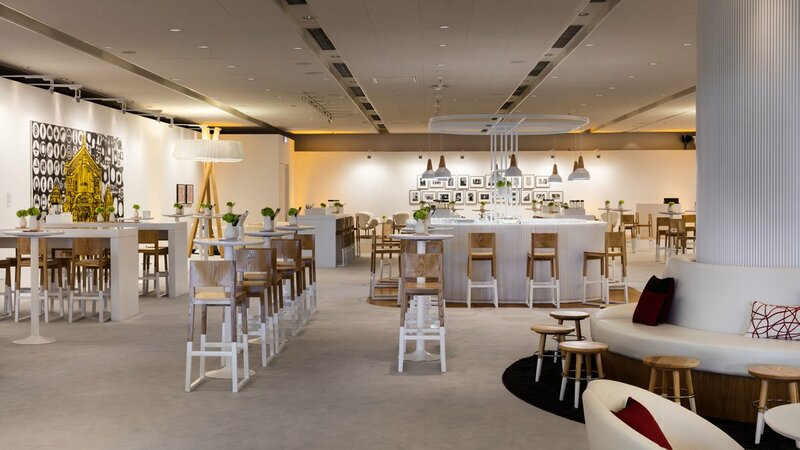 The UBS Lounge featured a selection of works from the collection, as well as highlights from the Irish-British artist Michael Craig-Martin RA, which all served to highlight a large sculpture of a light bulb. This was specially commissioned for Art Basel week and installed in the entrance of the Peninsula Hotel in Kowloon. One of Rozell’s first duties as the collection’s curator was to release a stunning new book about the catalogue, entitled UBS Art Collection: To Art Its Freedom, published by Hatje Cantz. It featured over 200 pieces from the bank’s collection of more than 30,000 artworks, including seminal works by Basquiat, Gursky, Hirst, Hockney, Kippenberger, de Kooning, LeWitt, Rauch, Rauschenberg and the local HK artist Samson Young, who will represent the city at the 57th Venice Biennale. Please tell us how you came to UBS and your route from the auction world into corporate collecting? I’ve got a very long and varied career in the art world. My last role was at Sotheby’s where I ran the arts business programme and wrote my book on collecting. When the job came up, I had never worked in a corporate collection although I had followed this particular collection for a long time. It is made up of a number of different collections, including the PaineWebber collection, and Don Marron, who was the company’s CEO, is still a very passionate and amazing collector. So, I was very intrigued and thought, why not? It’s always fun to keep learning. How is a collector-driven collection different from a curator-driven collection, and who are your collecting role models? I think that the best collections in any sphere are the ones driven by passion. The collectors I admire are people like Don Marron. A lot of corporate collections are created by one person at the top who’s passionate about art. That wasn’t the case with UBS as a whole, just certain parts of it. The downside with that is, what happens when that visionary leaves? That’s how a lot of corporate collections get dissolved. How much of your personal taste comes into the acquisition process? Quite a bit, I’ve been looking at art for decades and it’s about looking at the framework of what exists and using my knowledge and taste to fill in the gaps to take it further. So, I have an influence, but I don’t do it alone. We have an art board that makes decisions with me. The collecting process is based on need and the focus is now on building a collection that reflects our business today. UBS was a Swiss bank that merged with PaineWebber, an American bank. The collection started in the 60s with mainly Western art. It wasn’t until the 90s that it started globalising and the collections that now make up the UBS collection started connecting. There are works by artists from 74 countries, so it’s still a global collection. With so much of our business in Asia now, we want to buy more Asian art to reflect that. How do you ensure that your collection stays in touch with the local community, and that decisions made in a very local context are unaffected by a global idea of what contemporary art is? The art is in all our offices, so if we are doing the office in Singapore, we will send over some blue chip works to anchor this phase. We also want to buy works by artists from Singapore. For me, it isn’t just about buying the works, it’s also about engagement. That’s why I wanted Deborah (Ehrlich) here. I can buy all the Asian art I want in New York, but it’s about having somebody on the ground here who goes to the artists’ studios and is part of the arts community. There are cultural differences, so we may not be able to hang the same art in Florida that we do in Italy, and there are certain artworks we keep in the Hong Kong office. Both the understanding and perception is different, so we work with that now. Do you ever take the regional interests of your high-net-worth clients into account when you acquire work, or is it more academically and intellectually driven? No, but we certainly share our works with the clients and it’s a common conversation point. We have so many interesting clients and collectors, and it’s fun. You just want to learn all the time and that’s the greatest thing about art. You are never going to know all the artists and you continue to be surprised. It’s about this process of exchange, which is why I like to share the artworks and show them in the Art Basel lounge or do exhibitions, even within our own offices. Do you always meet the artists before you collect their works, and if not, what vetting process do you go through when assessing an artist’s career and their collectability? We don’t always meet the artists, but I do love to meet them. I’m always very interested in their background and look at where they studied and what their interests are. I want to learn as much about them as possible. My team will bring me something and I’ll say, “I want to know more about the artist’s career.” I am also very interested in what my artist friends think. I look at the artists’ track record and where they’ve had shows. We don’t buy from art schools, as the artists we collect usually have a bit of a track record of two or three shows before we start buying them. I always look at the greater body of their work. At what point does an artist like Samson Young reach your radar? Was he an artist you’d been following and considering prior to the announcement of his participation at the Venice Biennale? Well, you couldn’t escape learning about him last year because he had the big commission and BMW Art Journey. So, everyone knew who he was, and with Deborah wanting to collect local artists, he was obviously a candidate. Then, the works we are currently featuring in the Basel lounge came up and Deborah sent them over. He’s an interesting artist and personality and this wasn’t a big purchase, so it was a nice start. I love the way they look in the lounge. Another recent acquisition was Christian Marclay, who’s also done so much with music in his art. That is why they are hanging next to each other. Each time we buy a work of art, we always ask, “How does it connect with our existing collection?” There are so many different possibilities and many surprising things come up. 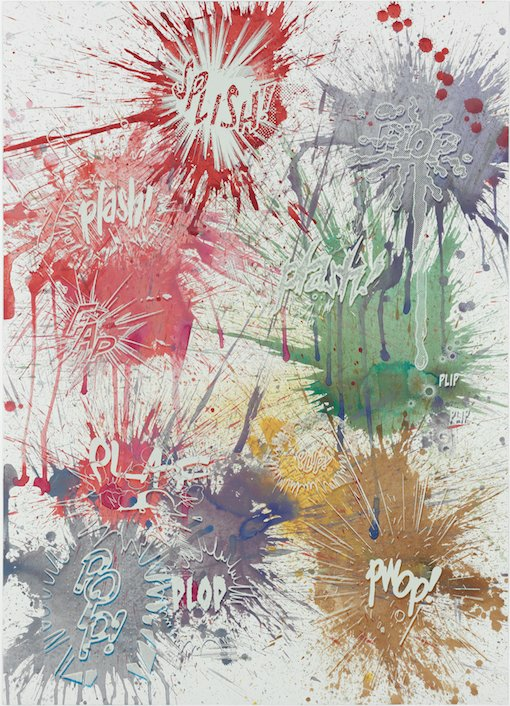 The Christian Marclay piece uses a lot of words and onomatopoeia, which is right next to the work by Ed Ruscha, who also uses a lot of text in his art. It’s all great fun. Are you able to take a lot of risks with different mediums at UBS? For example, non-traditional, video art and installation art. Not really. We’re very restricted by materials and don’t necessarily want to buy ephemeral works. In a corporate environment, we have to be careful about the placement of art, so material plays a big role. About 95% of artwork today won’t exist in 100 years’ time. Our collection already has a 60-year history. I always consider what a piece going to look like in 50 years. What advice would you give to a Chinese corporation building a collection for the first time, and why should a corporation collect at all? I think each corporation has to ask itself that question. Many corporations still collect and there’s a connection to their business. Like the Ritter chocolate company in Germany, which only collects artwork in the shape of squares, and the automobile association in Germany that only collect artworks related to transportation or mobility. So, first of all, it’s about your corporate identity, what you want to say with your collection and what purpose it serves. The same rules apply when anybody is collecting, you have to do the homework and research, and get out and see as much as possible. I think it’s also the collectors’ responsibility to know and follow the market, understand when there’s an opportunity and not overpay. What is your vision for the collection’s future direction and how would you like to expand? Do you look at gaps in art history that new research in the field is filling? Would you collect an unknown but recently researched mid-century artist whose importance had only recently been revealed? I am personally very interested in overlooked artists. These can be either artists in mid-career or those who were once big names and then fell off the radar. At the end of the day, it’s about the work. We have a mandate to collect the art of our time. Therefore, living artists are the primary market. But we do make an exception now and then and buy something on the secondary market, if it really belongs in the collection. We have a team in Zurich, London and New York. Hiring Deborah was a big part of that and it’s a big move to have somebody in the region. I really wanted to make my team collaborate globally, so there was a lot of integration and video conferencing. That was a big part of my first year – meeting each other and sharing our knowledge. The other project was the release of the big book on the collection, which meant learning about the history, seeing the connections and thinking about where we wanted to go. I decided we should reflect on our global business, get more women in the collection and fill the gaps. I want to support artists in different ways and build up a relationship with them. In future, I would love to sponsor artist projects that are not hanging on walls. I love speaking with the artists, like having Michael Craig-Martin here today, and collecting in depth, rather than just one-off artworks. We have 54 works by Lucian Freud and 61 works by Ed Ruscha. I like the idea of revisiting an artist’s work and having them come and speak to our clients, and finding other ways to support them. I don’t think we’re going to buy art forever and we don’t have a lot of work in storage, nor should we. Of course, I don’t know if we’re going to keep filling these lounges and keeping things fresh, but it’s a huge responsibility to have the art and it is not about the numbers. 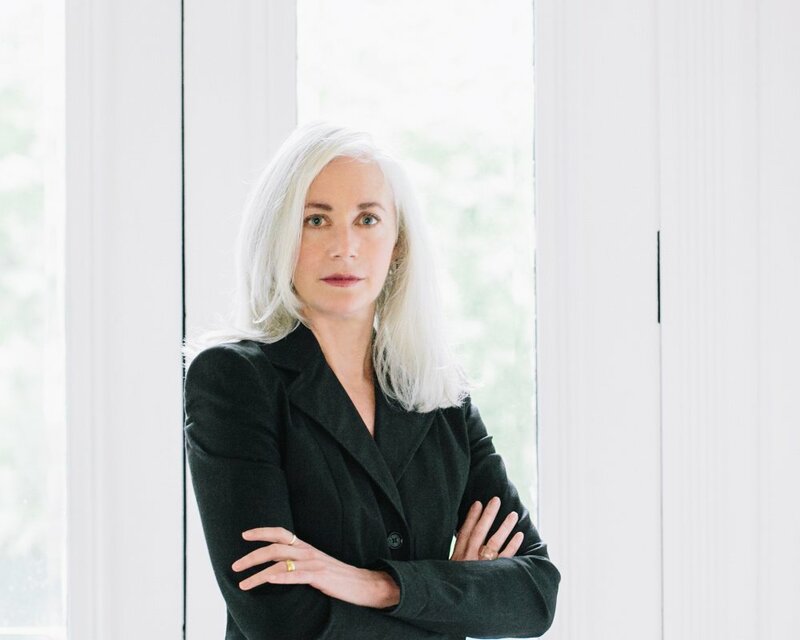 Mary Rozell is the new Global Head UBS Art Collection. She has been an advisor to collectors, artists and estates on legal and strategic issues relating to the acquisition, management and deaccessioning of private art collections. An art lawyer with a master’s degree in modern art from The Courtauld, she was until recently the Director of Art Business at Sotheby’s Institute of Art. 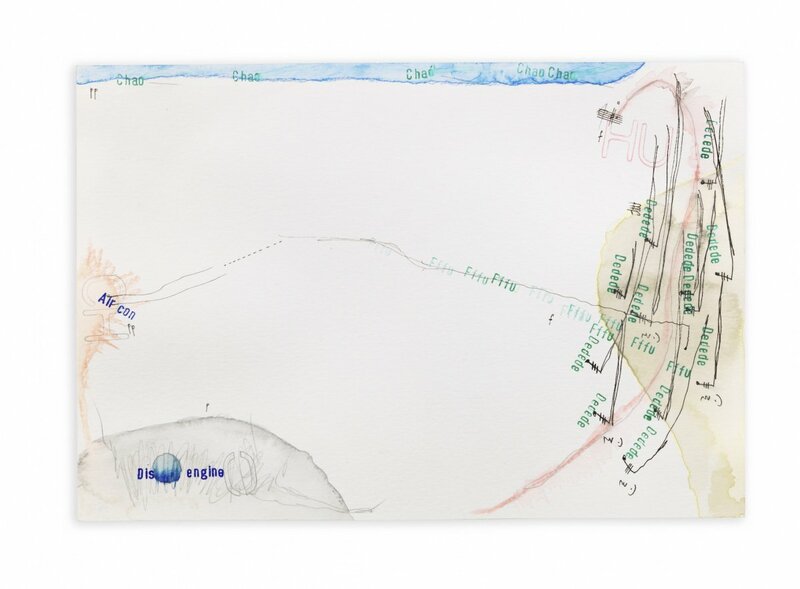 Rozell has also served as the director and/or consultant to several major private art collections, as well as Managing Director of the Swiss Institute – Contemporary Art in New York and Curator/Director of the European Studio Programme for the ACC Galerie in the city of Weimar, Germany. While living in Berlin for almost a decade, Rozell was the German correspondent for The Art Newspaper, a curator of contemporary art and a consultant to galleries and Villa Grisebach Auctions. She has written and lectured extensively about Berlin’s emerging art scene and architectural landscape, and is the author of numerous journal articles, catalogue essays and translations. Her most recent publication, The Art Collector’s Handbook, was published by Lund Humphries in 2014.